The Referrals tab on the GoldMine 8 main screen enables you to link one record to another or one record to many others. 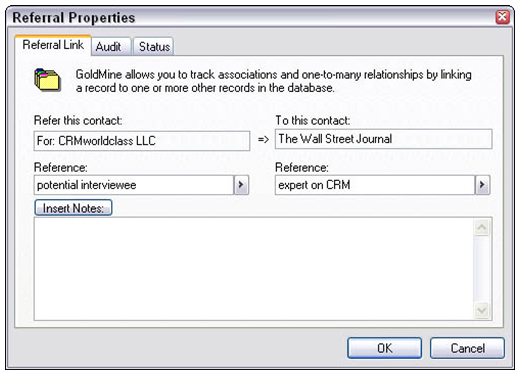 GoldMine’s Referrals tab is relational, meaning that one piece of data links to multiple pieces of other data. By linking one record to another, you can quickly see what the relationship between two or more records might be. Suppose for example, that your accountant referred 17 other clients to you. You thank her and record each of the referrals in your accountant’s GoldMine record. Makes her look a lot more important, doesn’t it? An important note is that the Referrals tab is bi-directional, so after you link A to B, B is linked back to A. The relationship works like a toggle switch. By double-clicking a referral listing, the record that the referral is linked to appears. You can get right back to the original record by double-clicking the referral listing again. Even if you don’t have to track leads you have given out to dealers, you may want to use the Referrals tab for some kind of related activity. Working with an account that uses a consultant (or an accountant, or an attorney) presents an opportunity to employ the Referrals tab. A referral is especially useful if this same consultant pops up in other accounts of yours, and it’s also relevant if you’re part of a multi-level distribution system. From the main GoldMine screen, click the Referrals tab. Right-click in the area below the tab and choose New from the shortcut menu. A window displaying all the records in your database appears. Double-click the record you want to link to. The Referral Properties dialog box appears, enabling you to enter the referral information. On the left side of the dialog box, you see the original record and an empty Reference field below it. On the right side of the dialog box is the listing for the record to which the referral is being placed. You use the two reference fields (one for each record) to indicate what the relationship is between the two records. Each of these two Reference fields can have a lookup list. If you plan to make extensive use of referrals, you should set up these lookup lists to ensure some consistency in the relationships you use.